Saying “Yes” to Jesus is a personal decision to receive God’s gift of love and it’s something to celebrate. If you have said “Yes” to Jesus or are just looking for information on taking this important step, we would love to hear from you! Please contact us at yes@sunvalleycc.com and let us know! We’d also like to invite you to download this free resource to help you better understand the Bible and God’s plan for your life. 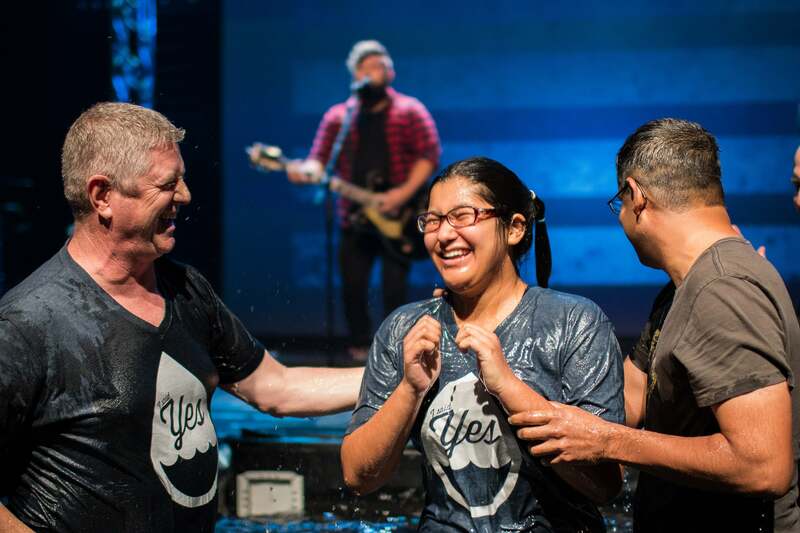 Baptism is a huge celebration at Sun Valley and there is nothing worth celebrating more than new life with Jesus! If you have said YES to following Jesus and haven’t been baptized, join us at our next baptism celebration! Register below for the next Baptism! Our next baptism celebration is May 18 and 19. If you have said “yes” to Jesus, we’d like to invite you to take your next step by getting baptized. Online registration will be closed Saturday, May 18, but you can still sign up on the patio that weekend! All campuses will be offering a class for children (K-6th) who have said YES to a personal relationship with Jesus and wish to be baptized. At least one parent or guardian must attend as well. Please be sure to register your child for both the Baptism Celebration and the SV Kids Baptism Class. If you are new to Sun Valley, we would love to meet you! Join us at our next New Here Dessert. This is an opportunity for you to meet the Campus Pastor and some staff, enjoy dessert on us, and ask any questions you may have. Love the message but want to go deeper? The SV Devotional is a 5-minute read designed to give you further content on our weekend series topic as well as time for reflection and prayer. Do this on your own or with a friend!